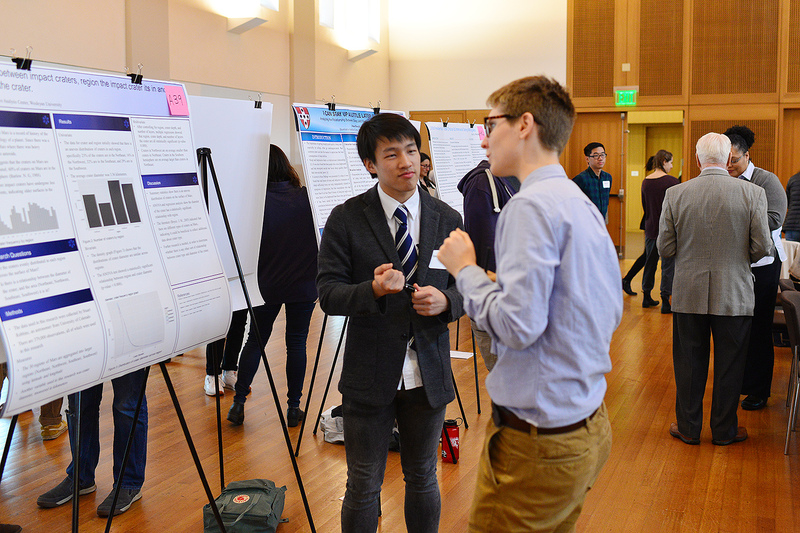 On May 5, 105 students presented their quantitative analysis research during a poster session in Beckham Hall. The Quantitative Analysis Center (QAC) hosts a poster session twice a year, which doubles as a final exam evaluation for its QAC 201 course. 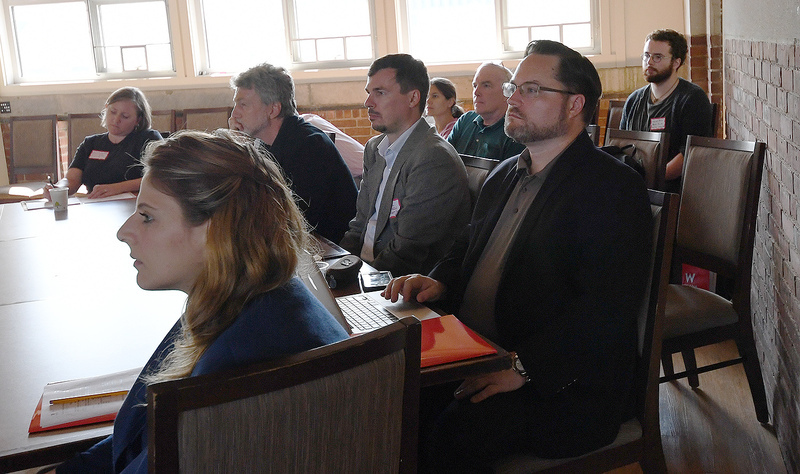 Nineteen evaluators, of which seven were Wesleyan-affiliated, attended and judged the projects. 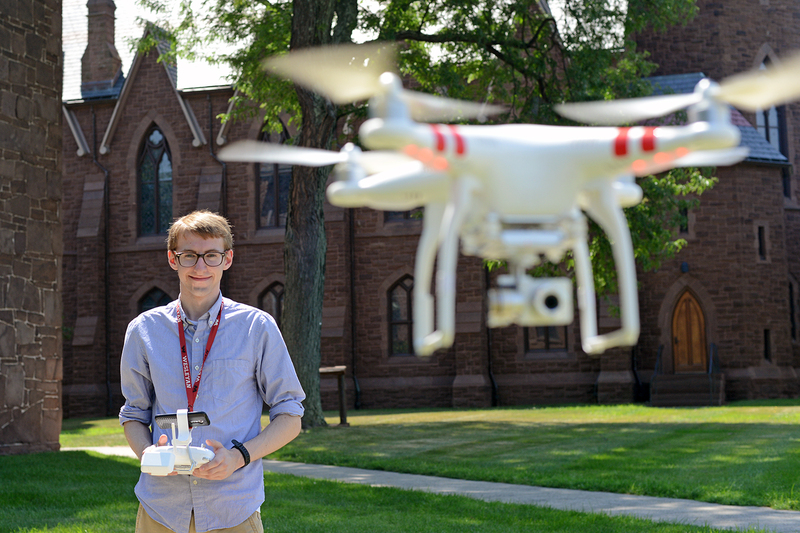 Students also had the opportunity to share their projects with fellow students, faculty, staff, alumni and friends of Wesleyan. In this project-based course, students learned to answer questions through independent research based on existing data. 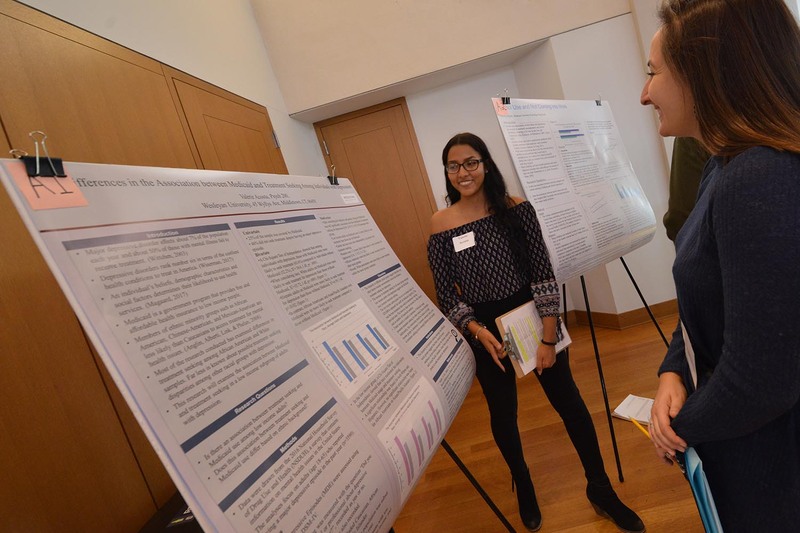 Students developed skills in generating testable hypotheses, conducting a literature review, preparing data for analysis, conducting descriptive and inferential statistical analyses, and presenting research findings. 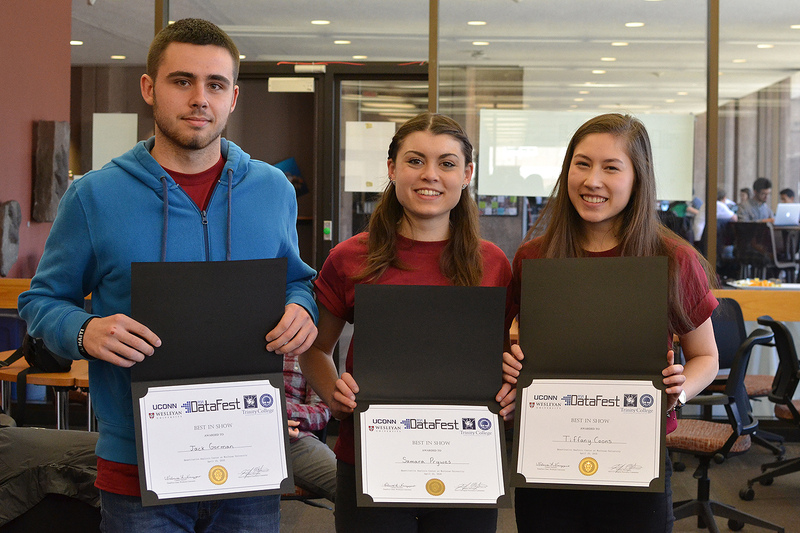 Students from six colleges and universities participated in DataFest March 29-April 2 at Wesleyan. 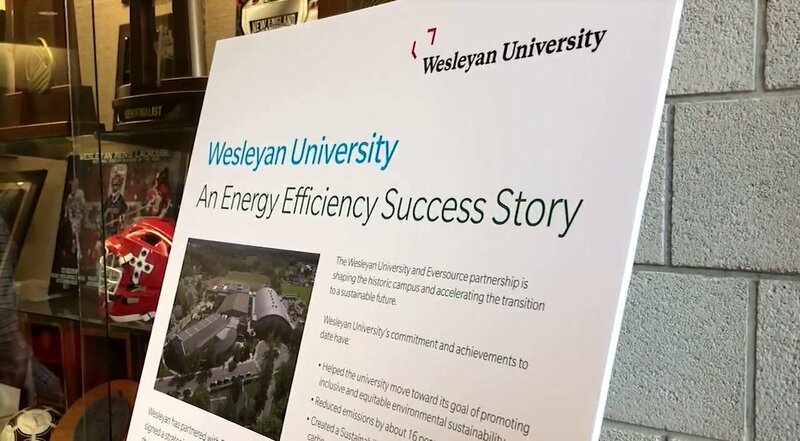 The Wesleyan team Data Baes took one of the top prizes for “Best Innovation” during DataFest, held March 31 to April 2 at Exley Science Center. Seventy-five students from six institutions participated in the annual analysis competition. During DataFest, students are presented with a large, complex data set and work over the weekend to explore, analyze and present their findings. 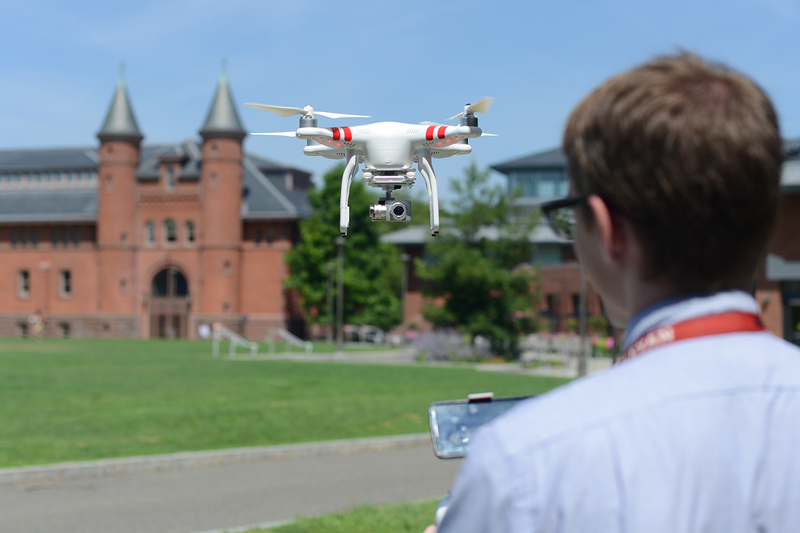 Teams of three to five students work together and compete against other teams from Wesleyan, Connecticut College, Yale University, Lafayette College, University of Connecticut and Trinity College. Under the auspices of the American Statistical Association, the event is organized by the Quantitative Analysis Center (QAC). 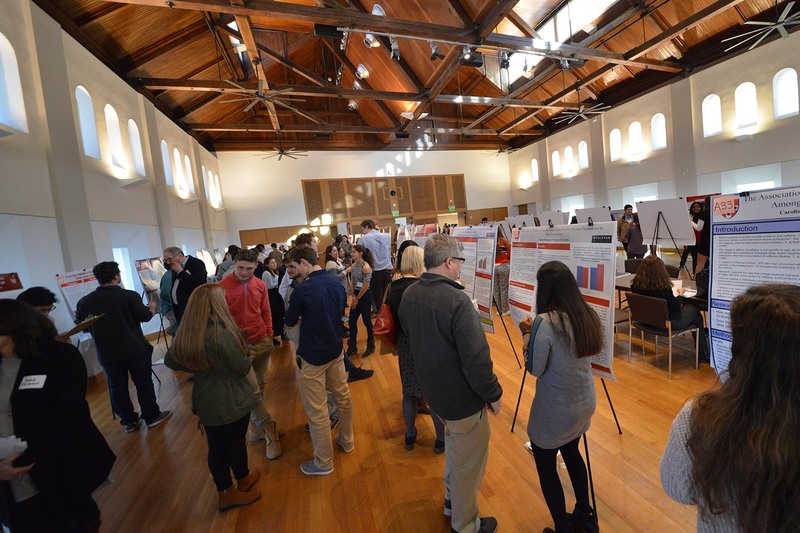 On Dec. 9, more than 100 students participated in the Quantitative Analysis Center Research Poster Session in Beckham Hall. 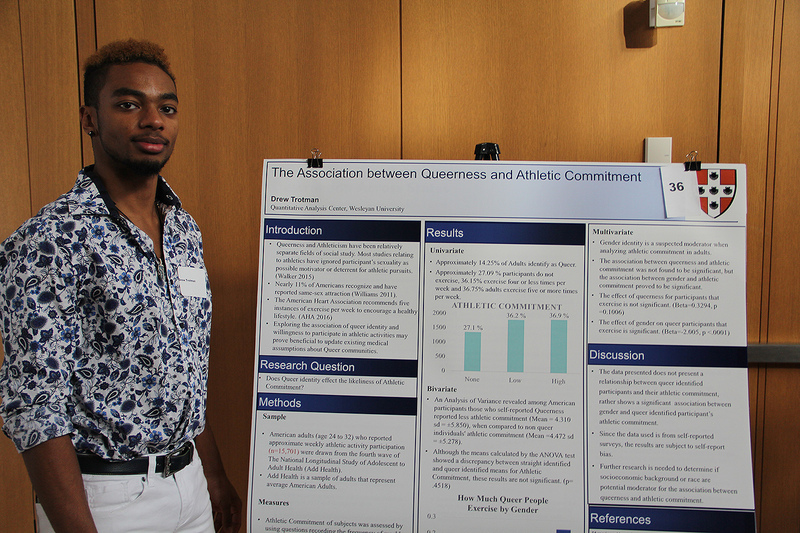 The poster session served as the students’ QAC 201 final exam. 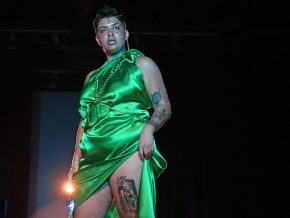 The event provides students with the opportunity to share the fruits of their work with others. 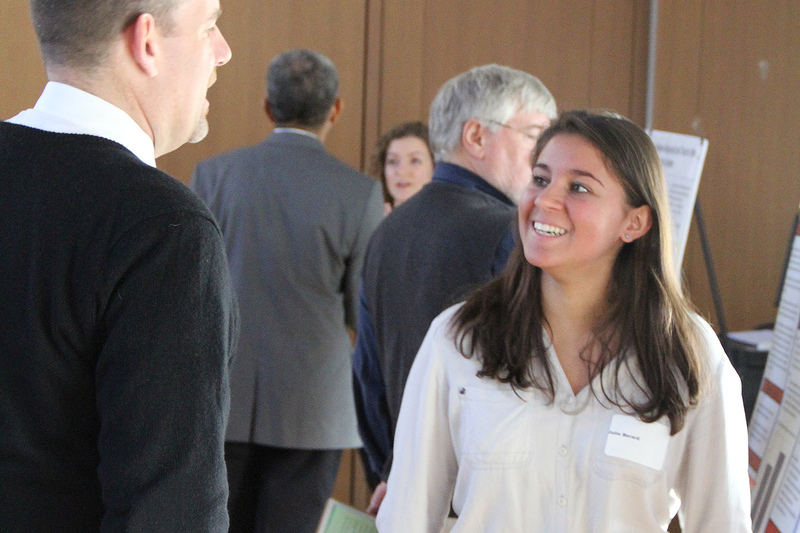 Several Wesleyan faculty and alumni evaluated the students’ poster presentations. Funded by the National Science Foundation, the QAC 201 course allows students to ask and answer questions about which they feel passionately. Students generate hypotheses based on existing data; conduct a literature review and evaluate the content of empirical research; prepare data for analysis; select and conduct descriptive and inferential statistical analyses; and present research findings to expert and novice audiences. By providing opportunities to learn one of four major statistical analysis software packages, and translate across them, this course aims to empower students to manage, analyze and interpret large data sets from a range of different disciplines. 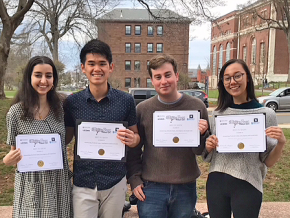 Three teams from Wesleyan received honors during the American Statistical Association DataFest, hosted at Wesleyan April 8-10. During DataFest, students are presented with a large, complex, surprise data set and work over the weekend to explore, analyze, and present their findings. 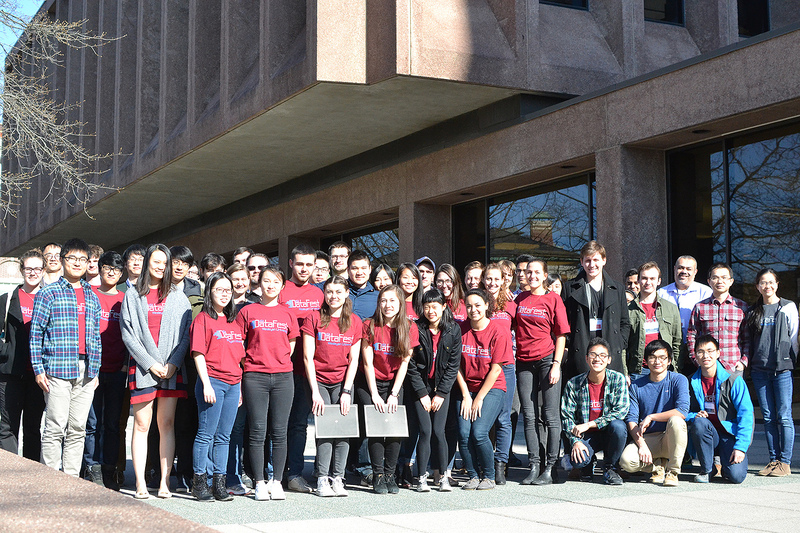 Teams of three to five undergraduate students from Wesleyan, Trinity, Connecticut College, Yale, and the University of Connecticut competed against each other. After two days of intense data wrangling, analysis and presentation design, each team was allowed only five minutes and no more than two slides to impress a panel of judges. 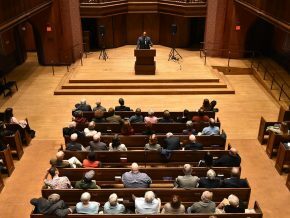 The event, coordinated by Wesleyan’s Quantitative Analysis Center, is part of a set of initiatives to strengthen quantitative reasoning and facilitate computational and data analysis work across the curriculum. It is designed to bring together current students, alumni and data analysis professionals as they work together in addressing real world problems that involve computational data work. The event also provided an opportunity for recruiters to connect with students who are interested and skilled in data analysis, and may be candidates for internships or job openings. Phoebe Keegan ’16, an economics major from Palisades, N.Y., has been passionate about real estate since she was a young child. She passed the exam to get her real estate license in New York at age 18, the youngest age allowed. After coming to Wesleyan, she also became a licensed agent at William Raveis in Middletown. This summer, Keegan worked at the Quantitative Analysis Center with Assistant Professor of Economics Karl Boulware to analyze data from the New York City Housing and Vacancy Survey, specifically looking at conditions before and after the rezoning of downtown Brooklyn. They are studying how rezoning affected occupancies in Brooklyn as well as gentrification issues. Joli Holmes ’17, an economics major, is one of 24 students in the Quantitative Analysis Center’s Summer Apprenticeship Program. 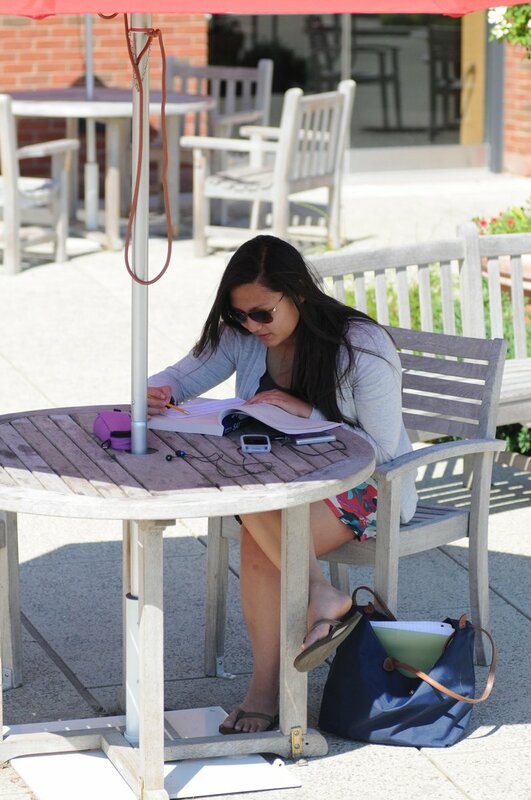 In this News @ Wesleyan story, we speak with Joli Holmes from the Class of 2017. 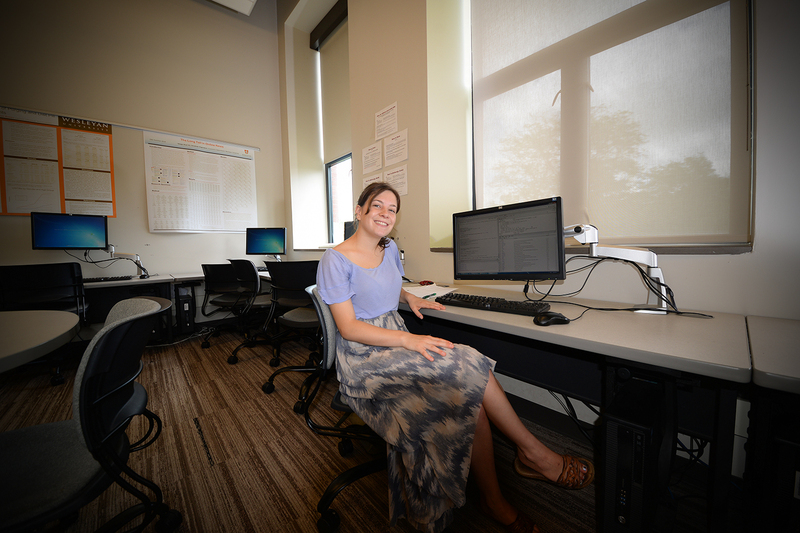 She is one of 24 students in the Quantitative Analysis Center’s Summer Apprenticeship Program. Q: Joli, what is your major and what’s your specific area of interest? A: I’m an economics major. I’m particularly interested in studying investment-related practices from an environmental and social perspective. Q: Have you worked in the Quantitative Analysis Center before this summer? A: I’ve taken a lot of classes through the QAC, including “Working with R,” “Excel with Visual Basic for Applications,” and “Python.” These are all classes on how to use statistical software, which also cover some statistical analysis topics. Q: What does an average day look like in the QAC Apprenticeship Program? A: We start our days at 8:30, and have class for an hour and a half. The classes are taught by Emmanuel “Manolis” Kaparakis, [director of Centers for Advanced Computing], Pavel Oleinikov, [associate director of the Quantitative Analysis Center, visiting assistant professor of quantitative analysis], and Jen Rose, [research professor of psychology]. The topics of these classes really vary. We cover everything from basic statistics – like how to do a simple linear regression and looking at correlations – to different types of clustering and factor analysis. In the future we might do some latent variable analysis. They make sure all the students have a good foundation, and then cover advanced topics. In these lessons, we work with statistical software and example data sets. For the rest of the day, we work on our individual research projects. 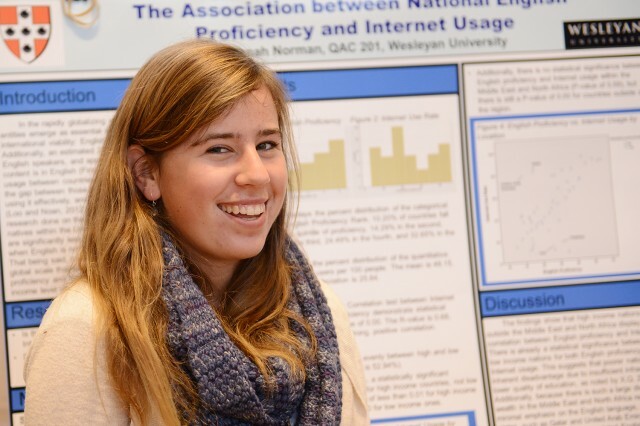 More than 100 students presented their quantitative analysis research Dec. 5 in Beckham Hall. On Dec. 5, the Quantitative Analysis Center (QAC) hosted its annual student research final exam evaluation event for its QAC 201 course. More than 100 students presented their projects at a poster session to fellow students, faculty, alumni and friends of Wesleyan. More than 100 students made presentations at the Quantitative Analysis Center Research Poster Session Dec. 6 in Beckham Hall. The poster session served as the students’ QAC 201 final exam. 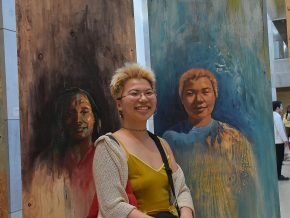 The event provides students with the opportunity to share the fruits of their work with others. 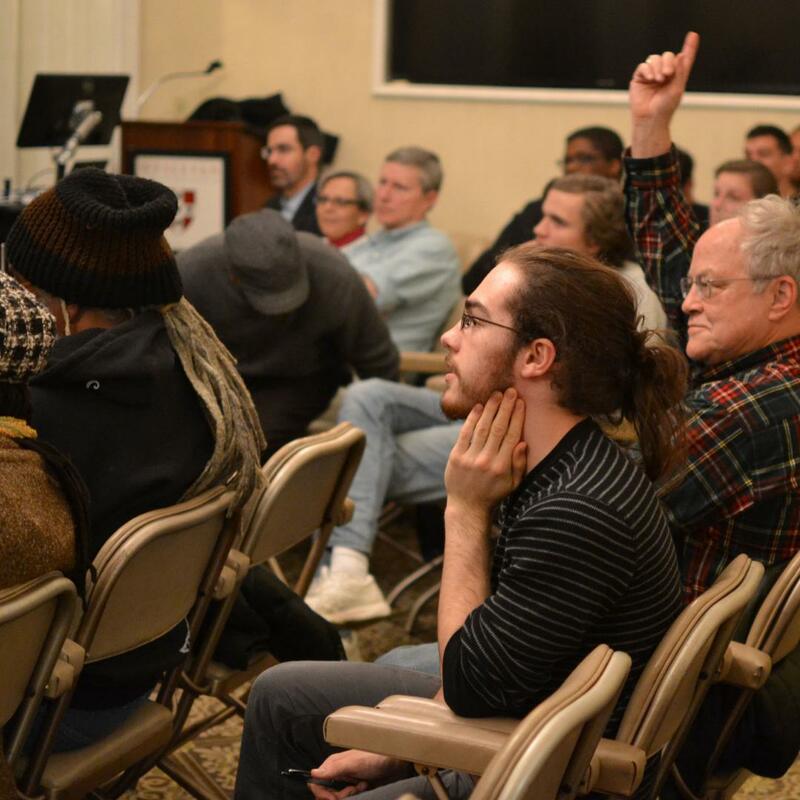 Several Wesleyan faculty and alumni evaluated the students’ poster presentations. 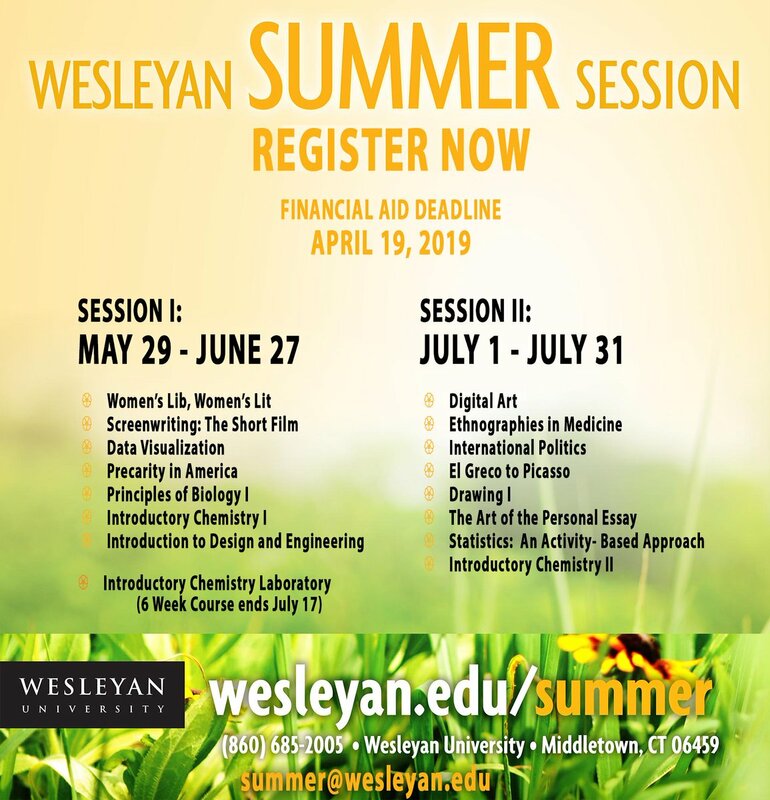 The Quantitative Analysis Center at Wesleyan has been developing an introductory course aimed at attracting a larger number of students to opportunities in the area of data analysis and applied statistics. Funded by the National Science Foundation, the QAC 201 course allows students to ask and answer questions about which they feel passionately. Students generate hypotheses based on existing data; conduct a literature review and evaluate the content of empirical research; prepare data for analysis; select and conduct descriptive and inferential statistical analyses; and present research findings to expert and novice audiences. By providing opportunities to learn one of four major statistical analysis software packages, and translate across them, this course aims to empower students to manage, analyze and interpret large data sets from a range of different disciplines.